Fred DesAutels was the official historian of Redford Township for many years. 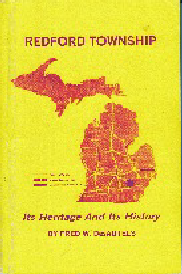 Written in 1975, Fred wrote of families, businesses, and township history. The book is soft cover with 200 pages. By Marjoria Norris Beavis in 1939. 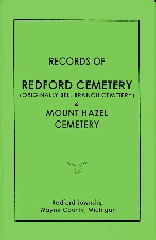 The original Records of Redford Cemetery and Mount Hazel was written in 1939 by Redford Cemetery Association Secretary Marjoria Norris Beavis. The “Green Book” version of 1994 added a supplement to update burials within the Redford Cemetery Grounds. A 2008 publication contains burials for Redford Cemetery only. Maps are available to view and purchase at the Historical Commission for 1876, 1915, and 1917. The Commission has poster-sized maps for 1876, 1915, and 1917. Maps for other years such as the 1936, Sanborn, and Plat Maps are available for viewing. Redford Township, Michigan: An Early History in Photos by former Commission member Ilona Klemm is currently available for purchase at Vicky’s Ice Cream, 26145 W. Six Mile Rd. in Redford and on Amazon.com. For more information contact: mollysydney@att.net. See photos on the early history up through the Second World War. Covers the geography and influences on the history and growth of the Township. Many rare photos including people, places, schools, churches and recreation facilities in Redford.